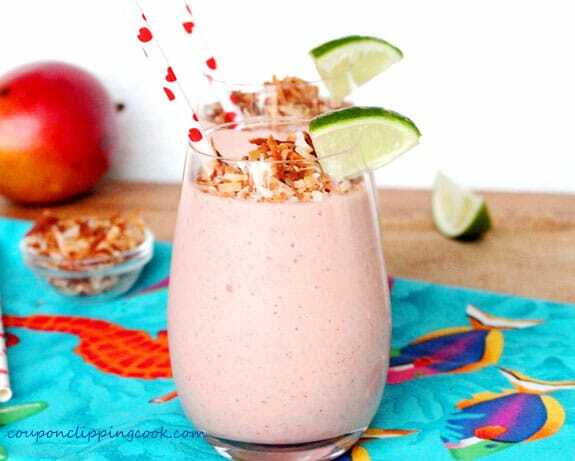 With a double hit of coconut, fresh mango and strawberries, this refreshing smoothie packs a coconut punch. 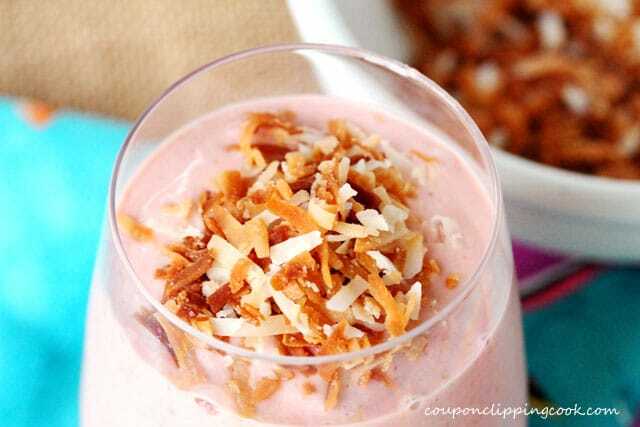 This thick and refreshing smoothie gets it’s tropical taste from coconut milk, toasted shredded coconut and fresh mango. 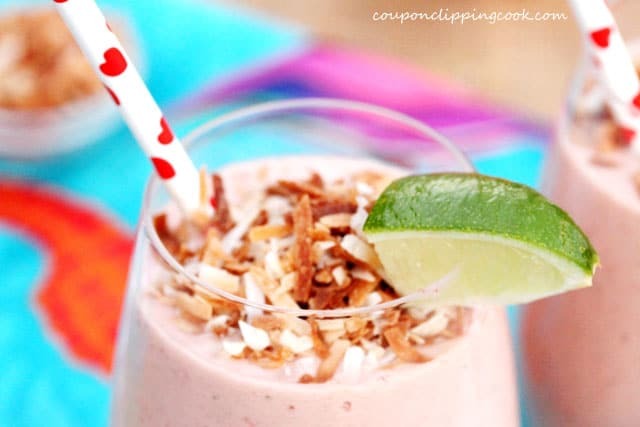 Lime juice gives this smoothie a touch of tart citrus flavor, and strawberries are added for an extra layer of flavor and texture. When buying fresh strawberries, I try to pick the container that has the best looking leaves on top the strawberries. 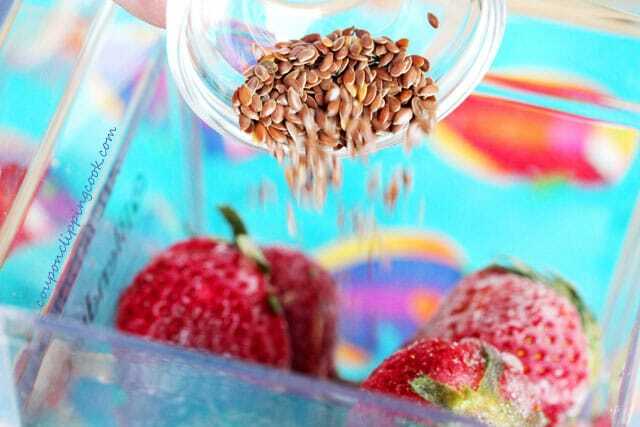 The container of strawberries with leaves that look fresh and green without any dry, brown or wilted spots are the ones I like to buy. 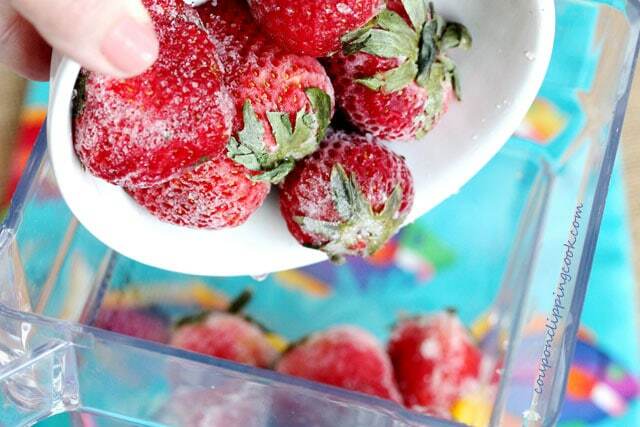 The trick is to use the strawberries when they’re nice and fresh. So often I’ll have high hopes for recipes using strawberries and get too busy to make them. 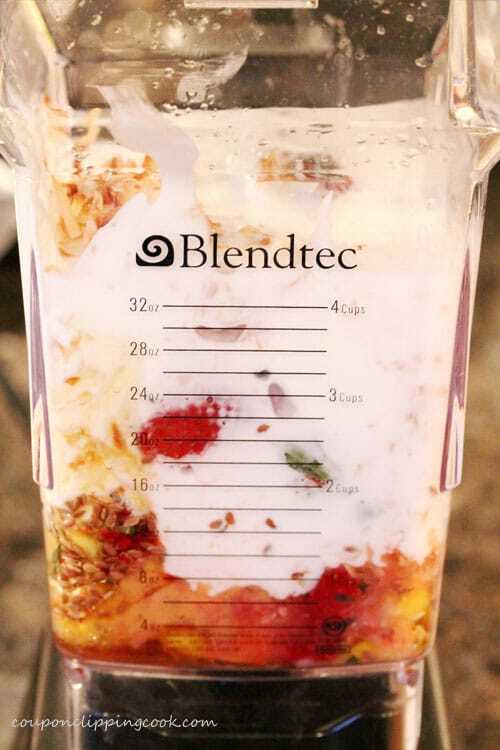 Then I know it’s time to make a smoothie to use up the berries. 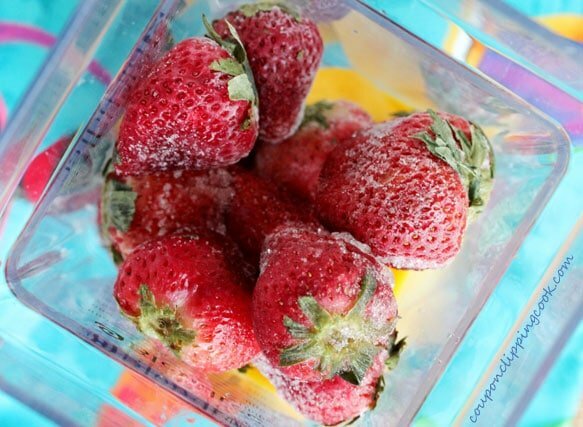 When the leaves on top of the strawberries are nice and fresh sometimes I’ll leave them on when making a smoothie since they’re edible. 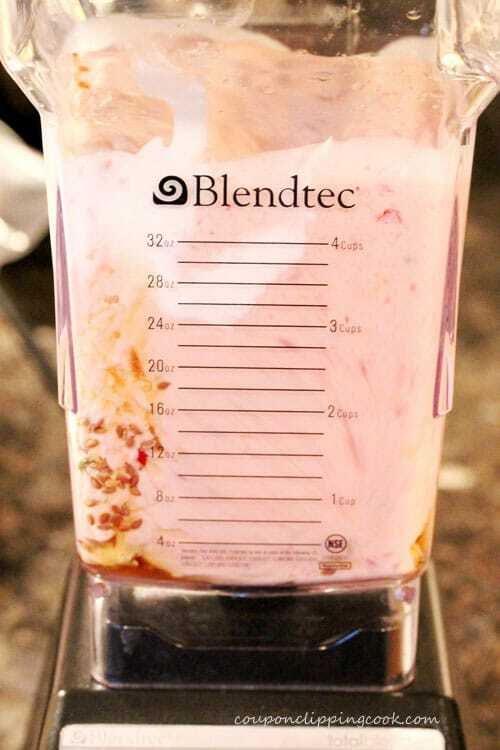 In addition to smoothies there’s other ways to put strawberry tops to good use. 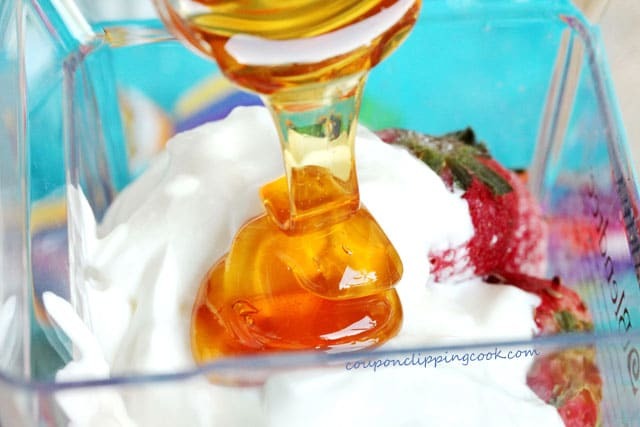 Here’s a link to an article with helpful tips from The Kitchn on what to make with strawberry tops. 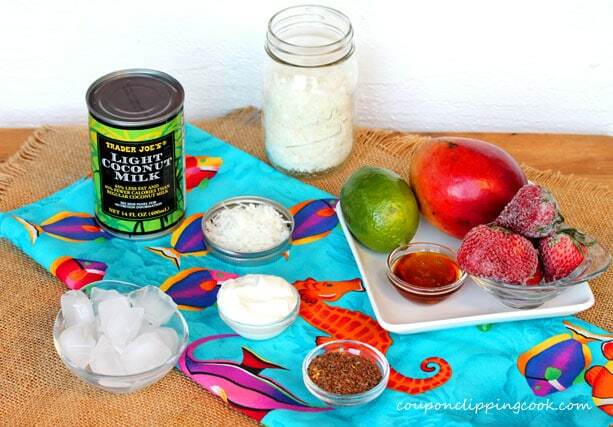 Let’s check out all the ingredients in this delicious smoothie. 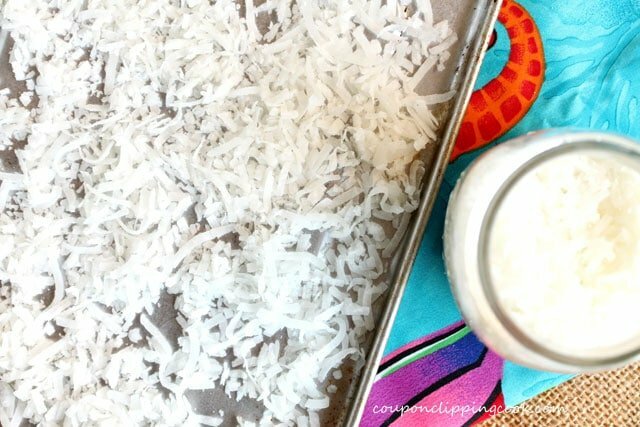 Spread the coconut out thinly on a cookie sheet. Bake in the preheated oven, stirring occasionally until it starts to turn brown (about 8 to 10 minutes). 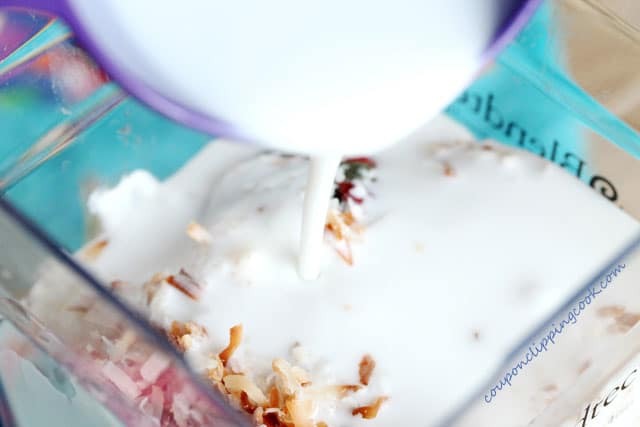 As soon as the coconut is done (watch it closely while in the oven), remove from the oven and let cool. 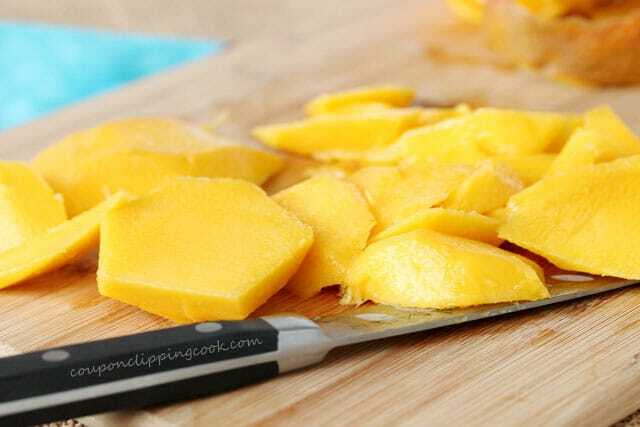 Remove the skin from the mango and cut the flesh off of the seed. 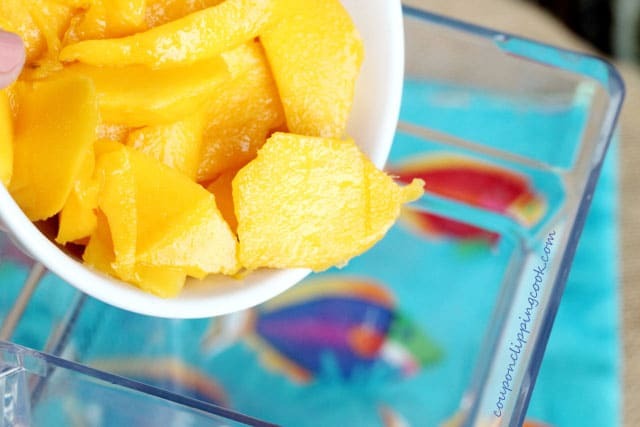 Cut the fruit into large pieces. 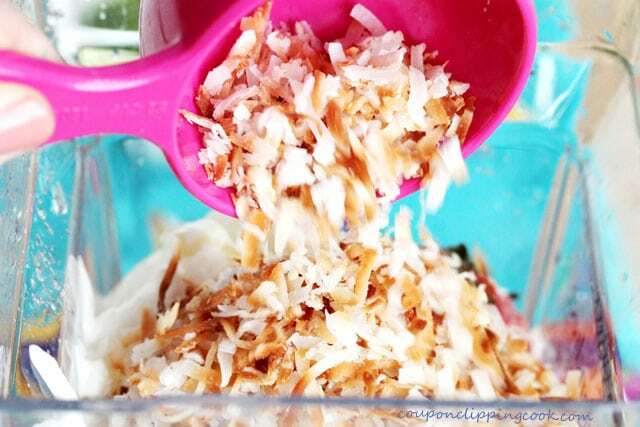 …and 1/2 of the toasted coconut. Then enjoy each and every sip. 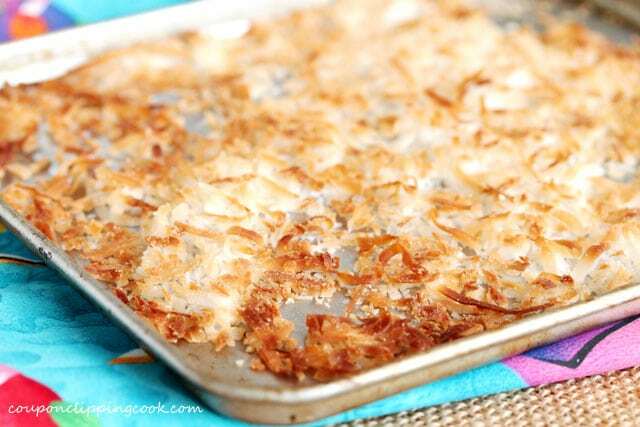 Spread the coconut out thinly on a cookie sheet. 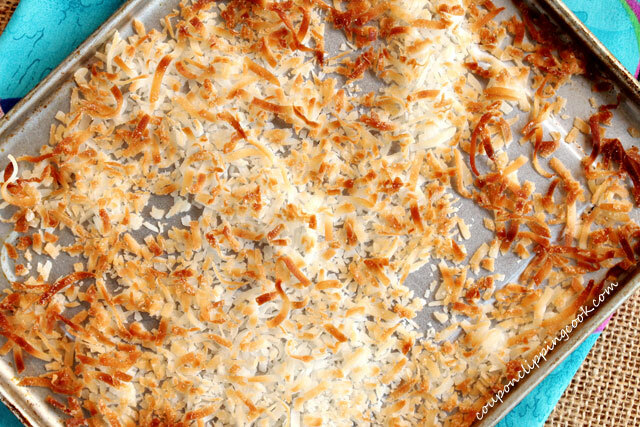 Bake in the preheated oven, stirring occasionally until it starts to turn brown (about 8 to 10 minutes). Watch closely and remove immediately. Let cool. 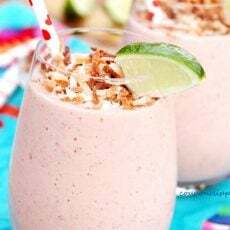 In a blender, add the flesh of the mango, strawberries, flax seed, yogurt, honey, lime juice, toasted coconut, coconut milk, and the ice cubes. 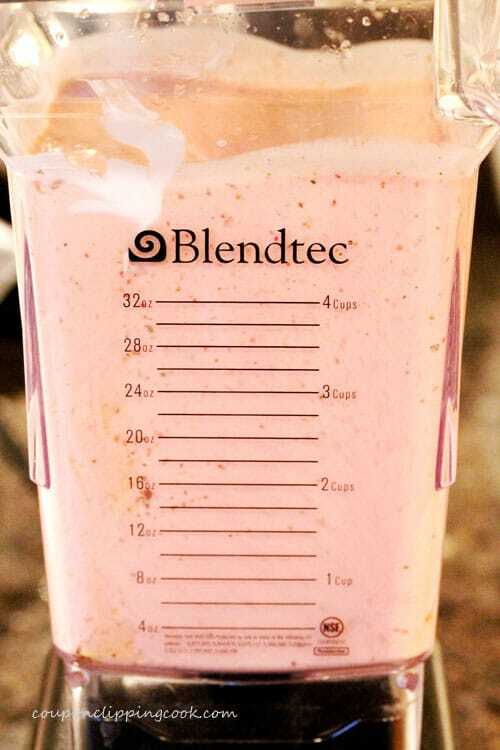 Blend on the smoothie or milkshake setting. 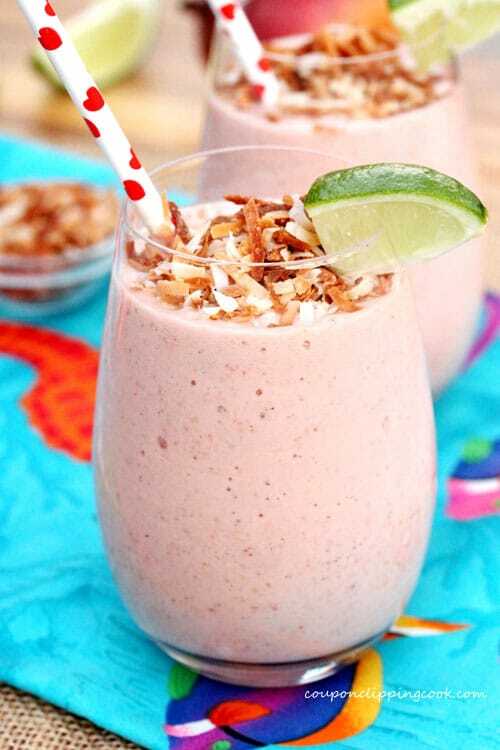 Serve right away while the smoothie is ice cold. 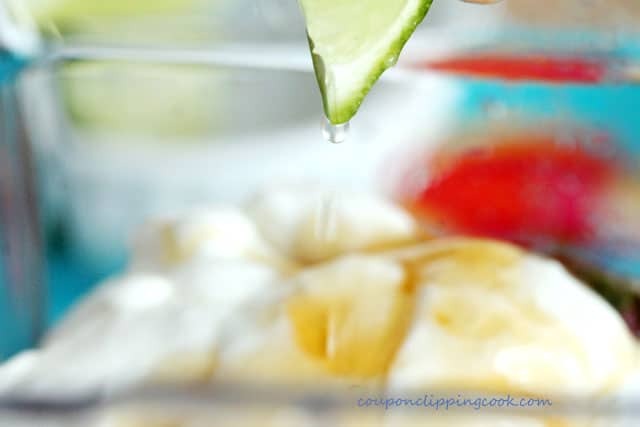 Pour into serving glasses, top with shredded coconut, and garnish with lime.